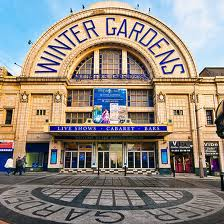 Playing a new arrangement by Derek Broadbent of Tchaikovsky’s ‘Capriccio Italien opus 45’, The Skelmanthorpe Band competed in the Senior Cup section of the Spring Brass Band Festival at the Winter Gardens, Blackpool. Using his high level of experience, Musical Director, John Roberts obtained a quality performance that demonstrated the band’s ability to respond to his desired dynamics and tempos. ‘There was plenty to enjoy in the approach of Skelmanthorpe’ outlined 4barsrest.com while the band’s solo horn player, Laura Brown said, “We played the best that we could and had a good day out”. She added, “I’m proud to play for Skelmanthorpe Band”. contributed to intonation issues throughout the event, this contest was predominantly one of contrasting interpretations and varying degrees of excellence. It was undoubtedly a demanding endeavour and would have been no less of a challenge for the Grand Shield competitors. Dr Nicholas Childs led Woodfalls to victory, which to the opinion of some, were the only band to rival Skelmanthorpe that afternoon. Unfortunately Skelmanthorpe Band achieved an unexpected 13th place but who knows what might have happened on a different day with a different Adjudicator…..